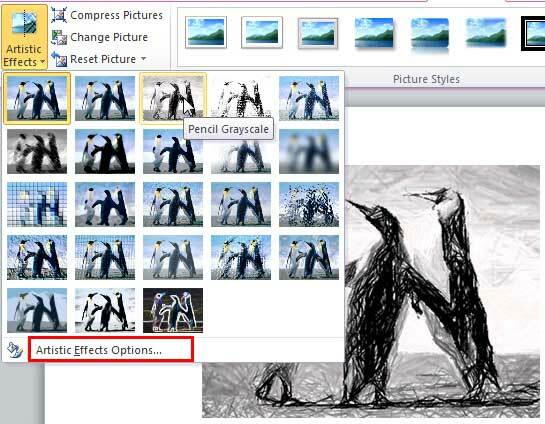 Within the Picture Tools Format tab, locate the Adjust group and click the Artistic Effects button (highlighted in red within Figure 2) to access the Artistic Effects drop-down gallery that you can see in Figure 2. To apply any artistic effect to the selected picture, just click on it. 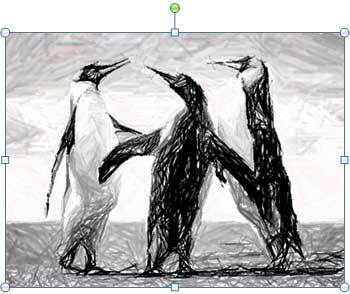 In Figure 4, you can see the Pencil Grayscale effect has been applied to the selected picture (compare pictures in Figures 1 and 4). 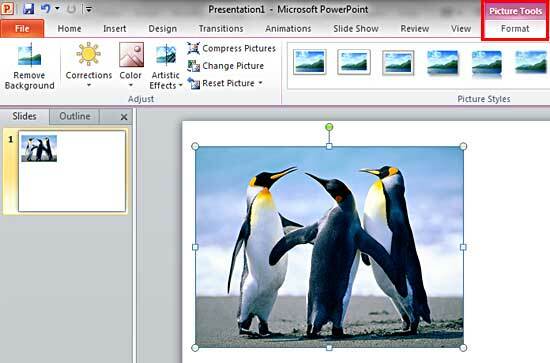 Once you have applied an effect to the picture, you can fine-tune the effect to control the resultant effect. 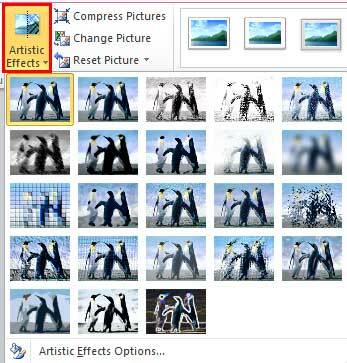 To do that, first make sure that the picture is selected, then access Artistic Effects gallery and click Artistic Effects Options, the last option highlighted in red within Figure 3, above. This will summon the Format Picture dialog box, along with the Artistic Effects option selected in the sidebar as shown in Figure 5. Note that the options available within this dialog box will differ, depending upon the Artistic Effect applied to your picture. 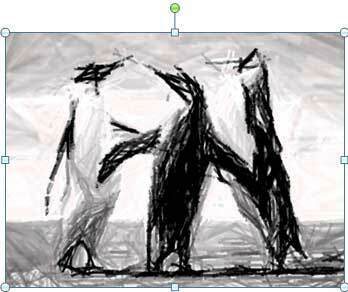 For the Pencil Grayscale effect, applied as shown in Figure 4 -- you can change the Pencil Size (highlighted in blue within Figure 5, above). We changed the value of this option from 27 to 54 -- and you can see the result in Figure 6 below. Do note that each Artistic Effect will provide different options. 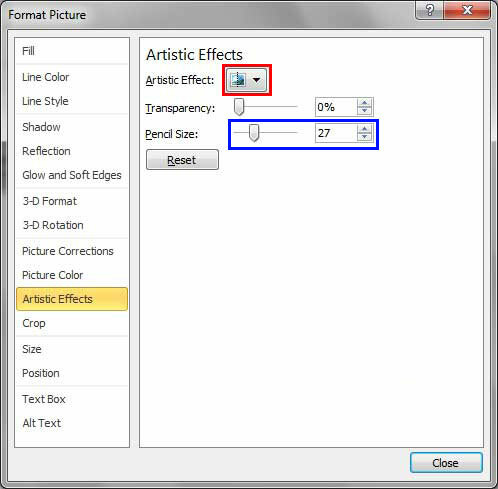 In fact, you can apply a new effect from the Artistic Effect button within this same dialog (highlighted in red within Figure 5). 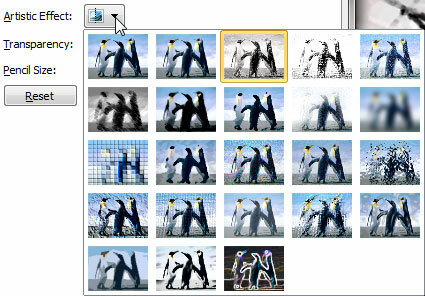 Click on this button to bring up the gallery shown in Figure 7, below. Note that this gallery is almost the same as the one you saw in Figure 3, above. Once you apply your desired effect and fine-tune as required, click the Close button to get back to your picture. Tip: You can follow the same procedure explained above to apply artistic effect to the picture used as a fill for a shape.